Regular Expressions. Search Bar. Line numbers. Multi-level Undo and Redo. Font/background color. Auto-recognition of UTF-8. Copy/Paste by mouse. Triple/Quad-click selecting. Tools like Shuffle Lines, Fun Case, Extract Words. Full support for binary files. Faster even on large files. Very long lines. And more. Overwrite mode. And more And more, and more.. Impressive update, don't you think? It includes features such as automatic completion of words, text statistics, multiple clipboard at your disposal, Favorites menu, and recent files and more. Excellent text editor. It's small, light, and fast. Very good collection of logical keyboard shortcuts. There is an issue with the INI file. 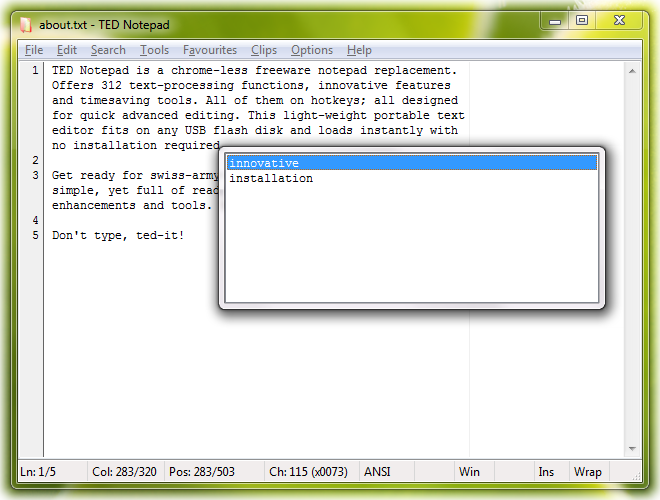 I can not make TedPad write to an INI file, which can be a problem for portability. Also there is a "Filters" file that makes things inconvenient. I wish the text filters were coded into the EXE file. I also wish TedPad were zipped instead of bundled into an install file, and had transparency for XP and Vista. A trash filter for killing ASCII characters above 127 (Like BDV Notepad)would be nice as well. TedPad definately has some shortcomings, but more than makes up for them with good solid features and performance. Give it a 4.5! In the past two years I have suggested 5 new features, all of them were implemnted within a few months top for the group of testers and they are all available for public now.. This editor is trully the most growing one in its category. Small but powerful. Get ready for a simple text editor, yet full of new features and text tools - you will never learn them all. Don't type, ted it! I'll stick with the venerable, middleweight EditPlus 2.30.x for now. And if I need to go lightweight, Radsoft's XPT simply cannot be beat, with a number of useful text editors clocking in at right around 9KB apiece. Oh, but, for now, version 4.5.3 seems to have an improved installer, that may solve all the problems with installation described by twosheds before. I think the installer is not a no.1 priority to this project. Personally, I prefer a ZIP package with files only (the exe file and the extensive manual), downloadable from the homapage anyway.